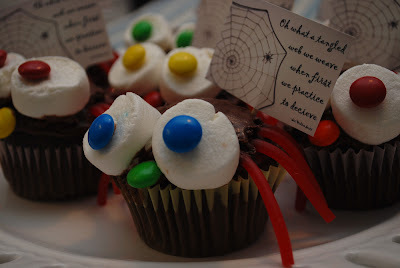 I made spider cupcakes for my Young Women's handout today. The lesson was on Avoiding Dishonesty. I used the quote by Sir Walter Scott "Oh what a tangled web we weave, when first we practice to deceive!" 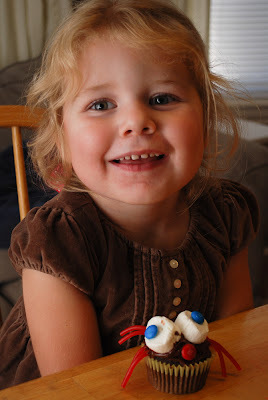 Lila helped me make a spider after church and lets just say, she LOVED it!! Emily, these are AWESOME! What a fabulous handout, and a great idea! You are the cutest! Very cute, Em! I am positive Lila had so much fun helping you make them, and I am also sure that she truly would eat a real bug. That Lila is just so funny! OK, so I'm pretty sure you must be the best YW leader ever! Your handouts are AMAZING! Way to go! These cupcakes were not only adorable but so delicious! And like always you did an awesomely fantastic lesson. I would eat one of those bugs. They look great. 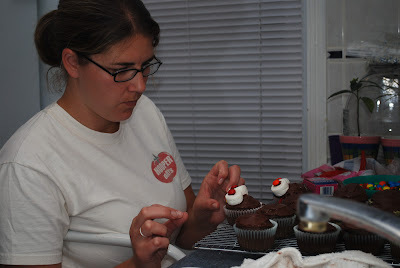 Those cupcakes looked FREAKIN' AWESOME!!! Not joking, those are the yummiest looking spiders I've ever seen. Your young women are so lucky to have you as their teacher. I'm sure you inspire them more than you think. What a fun post. Man, I never got awesome handouts like that when I was in YW. The spiders really turned out great. I bet your girls loved them. Good job Emily! You are amazing. I wish you were my young womens teacher Em!!! Gosh, or my cooking teacher or something!! Very creative!! how do you do it? how do you have 3 kids, look gorgeous, comment on other people's blogs, make amazingly intricate little treats for your pupils, and stay sane? you really are my hero, em. i know i say it all the time, but honestly, if i could do 1/8 of all that you do, i'd feel pretty good about life! We just liked the name Lillian... and it was just bonus to have a grandma to name her after. We will see though. We like all of them right now. We figure we need to weed one or two out each month. cute cupcakes, what a great idea! Oh so cute! I can't wait to steal this for my Young Women's lesson! I'm not sure how our Ward is so far behind, but absolutely LOVE the idea! how cute. I don't know how you do it all, and make time to make amazing handouts.